I must have been a terrible mother as was my mother before me…that is, by today’s standards. 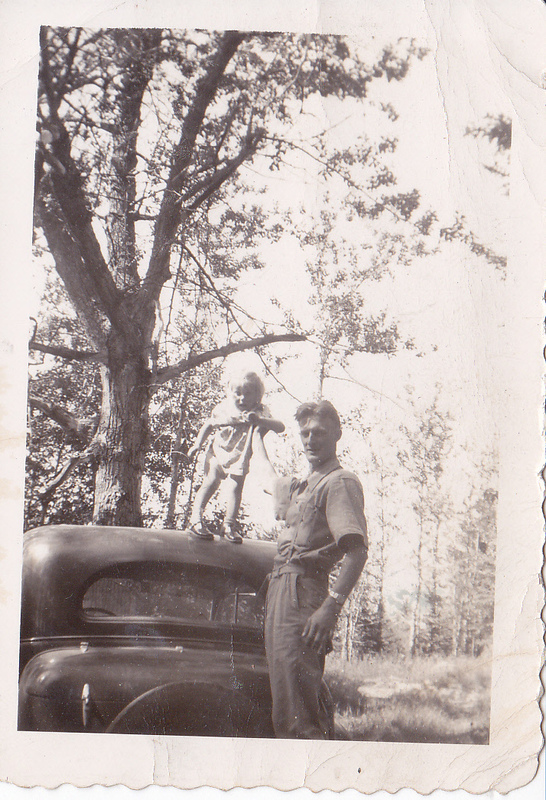 There’s the picture of my Dad holding a terrified me on top of the car , and he’s looking so proud of the fact he is terrorizing his only daughter. Well, someone better report him for child abuse, that’s all I can say. Another great example was the day my mother chased me along the path in the woods with a switch stick ( plenty of those living in the forest) because I played too long with my cousins and neglected the chores at home. I still remember the sting on the back of my bare legs. Bet they would have had to answer to a higher power had I possessed the child abuse hot line. Now mind you, I know there is a great need for authorities to step in when needed and, unfortunately there is a great deal of child abuse in this country. It is a world changing and I have been around long enough to see the change…yup, the time’s they are a changin’. I was no better at parenting. The four kids that came into the farm house in four years were subjected to threats constantly. My little switch leaned against the kitchen wall and when the boys got bickering, I would finally say, “OK you want the switch?” “NO NO NO” they’d say and head for the great outdoors. You know, I cannot remember ever having to do more than just reach for it and they were gone. The three oldest were put in the back seat of the car helter-skelter and the youngest I held in my lap as their father drove. When the family consisted of just the first baby, she was put in a portable bed and tossed on the back seat to ride merrily along. No restraints whatsoever and sometimes the rides were designed to make her fall asleep. The day came when I had my own little VW bug. Three in the back and one in the passenger seat telling me how to drive. I did not know, at the time, the two younger boys were taking notes to taunt me in my golden years. So I drove a little fast down Town Line Hill and through Velvet Hollow. Now I know this is a horrid thing to even admit, but being the honest writer I try to be, I shall lay it on the line. One day the four and I were motoring along in the little Bug. One of my fabulous four was in the “whining” phase of his life. After all these years, I remember the exact spot this happened. He was in the back seat whining in my left ear…it was constant like a mosquito at midnight in the dark of your bed. What he was whining about has long been forgotten, but the end of the rope had come. I hissed over my shoulder that he should stop or he would be walking home. ( Threat #1). It continued. I asked if he had heard me. No reply. (Threat #2) Whining continued. I pulled the car to the side of the road and said, ( I am sorry to even write this) “Get Out.” A primal scream , “Why, NOooooooooo”. I actually told the child to get out of the car and walk home. Now you know and I know I would never have allowed him to exit the car, but this was the (#3 Ultimate threat). Silence. Dead silence. I asked him if he was ready to be quiet so we could drive home and yes, he was, he said. Were it today, he would have been fumbling for his smart phone and the child abuse hot number and hey, who could have blamed him for having such a horrid mother? But , you know, that boy never whined again…at home or in the car. As you can see by the picture, there was no controlling them when outside. They hung upside down from trees, probably ate dirt and from witnessing it, know that they threw dirt at each other. I am sure they probably drank water from a stagnant brook and had I known about it, even I would have put a stop to that. At school, if there was any bullying, it was rare. There was one incident where a boy was making fun of one of my four and his brother knocked his two front teeth out…that was interesting. As soon as they trooped home from school and I heard the story, I immediately called the boy’s mother to apologize and to see what I could do…the teeth were permanent teeth at that point. The mother said,”Don’t worry about it . He went to the dentist and he deserved what he got.” Well what are the chances of that happening in today’s world. It might; I don’t know as I am well out of the scope of school activities now with even my grandchildren being OLD. How the world changes. 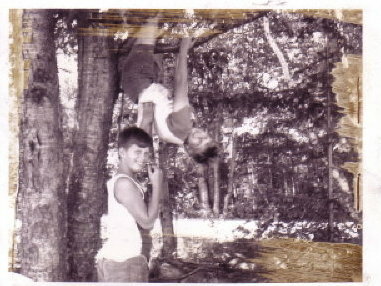 My brothers and I, along with most of the kids in that little town in Maine, more or less fended for ourselves as our parents worked in the mill. During the summer, we found what we needed to eat at noon, did our chores, built tree houses. I do have a couple scars from falling on my face racing from my brother during one of our classic brawls and one on my hand when a glass tumbler broke as I wiped it. That was life. We drank from the same dipper from a well. We probably double dipped if there was anything to dip into. Life was so simple. But we have to recognize the world is not the same now; life goes on but it changes every second. I just know I am glad my kids survived their upbringing because by today’s standards, I must have been one awful mother. Bravo to all the mothers today and grandparents helping out because it sure is a whole different story. It was last Saturday evening as I sat alone, staring at the street light on the intersection. What would I be doing if I were back in Greenwood Center, Maine, on a Saturday night back in the Fifties. Well, in the first place, I would be full of energy as a teenager and wondering “what was going on” that evening. Since we had no phone with my father declaring we would never have one in the house disturbing him, I had to rely on word of mouth. At the time dance halls were “the thing!” My mother loved dancing more than anything , even after working long days in the mill all week. Saturday night was the night for her to “kick up her heels”. Fine with my father as long as he did not have to participate. There were times , though, when he gave up his western dime novels, changed his mill “dickies” for his “good dress” pants and off they went. Sunday morning conversations were always a delight. Over the morning coffee would be the usual complaints from my father. The hall was too hot; the hot dog dry and too much noise. This , of course, made my mother just cringe having to listen to criticisms of her favorite pasttime. In fact, the truth was the only dance my father wanted to do was the polka. He was not a tall man, but much taller than my five foot tall mother. As she told it, he always grabbed her and SLUNG her across one side of the dance hall and it was pure hell when they came to corners as she had no idea where his feet were going or where she would end up. She remarked that one day she felt like he might throw her through the side of the building simply because he had no clue himself. I think the fact that he threw in a few clog steps might have thrown her off as well. The story goes..and I am not sure this is totally true…that one night at Abner’s dance hall, there were not enough polkas played resulting in my father becoming bored. Mother continued dancing, no matter the song but suddenly heard a strange sound from the orchestra seating. She looked up to find my father had taken a seat at the piano and had decided to become part of the band. He did not know how to play a piano nor did he care at that point. It is to their credit the band was very good natured about the sudden appearance of this addition and gracefully brought the tune to a closure, while my mother escorted him from the stage. That whole episode was credited to maybe a few too many “Old Narragansett” beers , if I understood the Sunday morning briefing correctly. There was also the episode of my father’s “disappearance” as we referred to it in later years. Again, mother was so desperate to go dancing, she agreed to have him accompany her if he could “behave himself.” At the morning briefing, it seems she heard a polka start and couldn’t find him. Thinking it was unusual for him to miss the only dance he would tolerate, she started searching. Nowhere was he to be seen inside the hall. Finally, she ventured outside , looked up and my father was climbing a huge evergreen, being egged on by someone probably just as ill-behaved as he was at the moment. She left him there, went inside, found a polka partner and said for once she rounded a corner with both of her feet still on the floor. I really liked those Sunday morning briefings. There was Abners in Albany, Benny’s or the Bluebird Pavillion down on Route 26 and over Hanover way was the Top Hat Pavillion. Those were the three hot spots..that is, until that big box with the picture showed up. Television started to make its mark and word was that dancers were staying home to watch one show or another. My favorite was George Goebel and I have to admit I spent a few Saturday nights at home to watch this new form of entertainment. My father divided his time between his western paperbacks and watching Lawrence Welk so he could see with his own eyes, the fabulous Myron Floren on the accordion playing…what else…polkas! Meanwhile, my mother accepted the television, but in her heart nothing could replace getting out of mill clothes, putting on a pretty dress , her dancing shoes and heading for one of the local dances. Father sat in his morris chair, feet on the hassock, paperback balanced on one side and wished her a happy time. His one constant remark was “Come in quiet and don’t make a lot of racket.” …which brings to mind the one occasion I accompanied my oldest brother to Abner’s..when I was probably sixteen years old. After the dance we rode around as teenagers did back then and ended up sitting and talking with some others. There was no such thing as a clock in our minds. We drove into the yard and let the car coast to keep as quiet as possible. My father was not concerned about my brother as he was, by then, old enough to take care of himself, but his daughter was another issue. I tiptoed up to the door, reached out for the knob and my father was on the other side. He opened the door, looked at me and with a grand gesture of his hand straight ahead, remarked, “The sun is coming up over Moose Cove.” That was all he said; that was all he had to say. I went up the stairs to my bed in probably three leaps. It was not mentioned in the Sunday morning briefing but I figured I had come pretty close to disaster. From that day on, I let Mama dance the polka.